Fifteen-year-old Akaela doesn’t know what fear is. She was built this way. But in a world where survival is no longer of the fittest, being fearless can become a deadly curse. 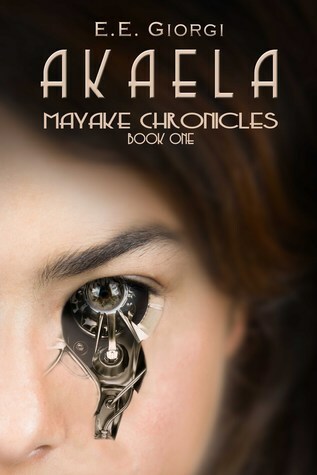 This book had me at implanted nanobots and chips – I’m a total sucker like that for sci-fi. The touch of dystopia thrown in was just a bonus. The world-building is a strong point in this book – a breed of people with various types of enhancements on the verge of extinction, a plague that has wiped out much of the population, and a controlling, inflexible leadership. The group of teenagers who hope to change things and help their people, Akaela, her brother, Athel, and friends, Lukas and Wes, were easy to relate to, and I especially enjoyed Lukas and the very literal way he sees the world. Something I really appreciated was the lack of a love interest or triangle to distract the reader from the focus of the story, the teenagers’ attempts to find their fathers. The descriptions were very vivid and the writing flowed well, with the end touching on melancholy and setting the stage for the next book in this series. The only thing I struggled with was the pacing. The first part of the book was a little slow for me, but the climax felt rushed and ended suddenly. With this being a short novel, maybe things could have been evened out a little more. If YA sci-fi/dystopian/mystery is your thing, this is your book. I received a digital copy of this book from the author in exchange for an honest review.